Businessman Kuda Tagwirei, has triggered off fresh fissures within Zanu-PF and government, with the Sakunda Holdings founder wittingly or unwittingly driving a wedge between President Emmerson Mnangagwa and some of his allies over the tycoon's unsettling influence. Barely a year after a soft coup that ousted Robert Mugabe, Mnangagwa's administration is facing a huge crisis caused by an imploding economy. He has declined to speak to the Press about these allegations. Despite his fabulous wealth and power, he now seems to have fallen afoul with Mnangagwa, and is facing unrelenting persecution, with his business being hammered endlessly. A Communications Taskforce appointed by Finance minister Mthuli Ncube and headed by Acie Lumumba made shocking allegations last week, claiming "Queen Bee" — widely viewed as Tagwirei — was part of a syndicate fuelling the foreign currency black market by supplying street dealers with bond notes and corrupt allocations of foreign currency from the Reserve Bank of Zimbabwe (RBZ). 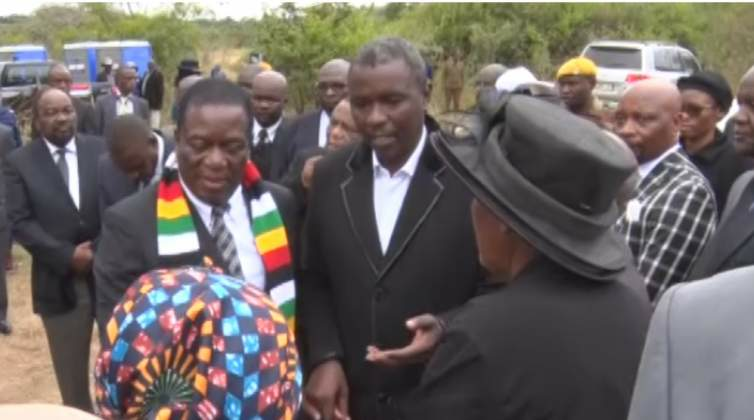 Grey-haired and tall, with piercing eyes and a quiet, hushed voice, the Sakunda boss was then lynched by Mnangagwa's special advisor Christopher Mutsvangwa, who brazenly accused him of "dividing the presidium". But Mnangagwa's spokesperson — George Charamba — rejected the claims yesterday, saying: "We will tell you when we are divided." Asked if there is still unity in the presidium, Charamba retorted: "To answer that question means there is a problem." "Not a single day passes without a conversation between Chiwenga and Mnangagwa and, as a matter of fact, the same person who is accused of dividing the presidium is the very person who is providing vehicles?" he asked rhetorically, referring to the allegations that Tagwirei had purchased top-of-the-range vehicles for the presidium and their spouses, service chiefs as well as other top Zanu-PF and government officials. In a wide-ranging interview with the Daily News, Charamba said claims that an oligarchy has captured the presidium, with Tagwirei's influence said to be extending right up to the RBZ, were not true. "This is just an allegation and we will treat it as such and nothing else. At the heart of it all is just a simple commercial issue which doesn't need so much political bicker. What it needs is capital, business acumen and business decisions —finish. The presidency speaks for itself — it doesn't need an interlocutor body," he said referring to Mutsvangwa. Charamba also dispelled claims that Mutsvangwa was Mnangagwa's hired gun. He said: "Really, I don't know. You know what, to be frank with you, no one in the presidency is concerned about that allegation, whether hired or shooting on his own — who cares? The country goes on, and as you can see, at the height of the allegations, solutions are being made, which is what matters; and solutions which are all encompassing, including the persons making the allegations; they also go to the same oil companies to refuel." Charamba said Tagwirei must actually be commended for ending fuel shortages, referring to the move by Sakunda to give government 100 million litres of fuel this week, which will only be repaid after 12 months. He said a monopoly cannot be ended by "bickering but by organising and importing". Asked about Sakunda taking over the Feruka pipeline, Charamba retorted: "No, the pipeline you rent to use it. It's not like it is always pumping 24 hours. "The way to stop a monopoly is to make sure you get in as a player. There is no law, there is no convention, there is not even an economic principle that stops anyone from getting into the fuel sector," he told the Daily News. He declined to comment further on the allegations. Tagwirei — whose father's death earlier this year halted government business as virtually all ministers abandoned their workstations to attend his burial — was recently interviewed by the police, although it is not clear whether the police team unearthed evidence of illegality or if the questions were simply exploratory in nature. Police also wanted to search his home but he reportedly left for Wedza for Chiwenga's rural home, where he was recuperating far from the hustle and bustle of the city. Government insiders alleged Mutsvangwa was hammering Tagwirei because he was keen to replace dominance of Sakunda with MOGS Oil & Gas Services — a Johannesburg-based fuels company which owns and operates pipelines, fuel storage facilities and other oil and gas infrastructure across Africa and further afield. Mutsvangwa, who has been vocal about breaking Sakunda's monopoly in the fuel industry, was said to be MOGS' front, and reportedly approached Mnangagwa with a proposal to have the pan-African leader in the oil and gas midstream infrastructure sector to build a second fuel pipeline from Feruka. He was said to be in partnership on the MOGS deal with former senior MDC official Eddie Cross. The Daily News heard that towards elections, Mutsvangwa reportedly told Mnangagwa that he had been working with Cross on the MOGS deal since the coup and that Cross will no longer root for opposition leader Nelson Chamisa in the elections. Cross has since exited the MDC Alliance after pouring scorn on the party. Reached for comment, Cross said "there is a measure of truth" in the claims. He said he has been involved in talks to have MOGS build a second pipeline since the days of the government of national unity (GNU), a project he said was mooted by then Energy minister Elton Mangoma. "During the GNU, I was asked by Mangoma to find a company which could build a new pipeline from Beira to Harare to supply regional states from regional fuel pool in Harare, centred in Mabvuku, where we have a large fuel storage facility that can take 400 000 cubic metres of fuel," Cross told the Daily News. He said he embarked on a programme to find a suitable partner and opened talks with MOGS. Cross said the deal was put on ice after the dissolution of the GNU. Then after the coup, Cross said he was asked by Mnangagwa as part of his 100-day plan to revive the deal with MOGS. He said a deal was reached on December 13, 2017 with MOGS. Cross said at the end of January, the deal was put to Cabinet but was blocked by "senior elements". "The reason given was that the pipeline was a strategic asset and (a) private company can't own shares," Cross said. Mutsvangwa rubbished the allegations made against him yesterday. "I have completely nothing to do with this except promoting those who want to invest. Ask (the) permanent secretary in the ministry of Defence. This company MOGS has been here since 1994. All companies come to my office. It's one of many; there are 15 other companies that are interested," Mutsvangwa told the Daily News. Asked if he was in a partnership with Cross, Mutsvangwa said: "It's nonsense." Asked if Cross was a front for MOGS, Mutsvangwa said: "I don't know, I can't speak for other people. I can only speak about companies that come to my office. Why don't you speak to Eddie, I can't speak about Eddie's business." The Daily News can exclusively reveal that Mnangagwa met with Errol Gregor, the chief executive officer of MOGS, on Monday to tie up the deal to start work on the second pipeline, with the project said to be worth $800 million. The meeting was also attended by Joram Gumbo, the minister of Energy. This has heightened tensions with Sakunda. Recently, Gumbo clarified that Tagwirei's Sakunda, through Trafigura, does not hold the sole and exclusive right to transport all petroleum products imported into Zimbabwe through the pipeline. He also denied claims that Sakunda now controls the pump station at Feruka, the pipeline and ancillary assets from Feruka to Msasa, the pump station at Wilton near Marondera as well as the tank farm at Msasa. "It's a pipeline that is owned by a JV, a joint venture company, between the government of Zimbabwe and Mozambique CPMZ (Companhia Do Pipeline Mozambique). There is no problem about bringing in fuel into the country," he said. The 208-km long Harare-Feruka pipeline was owned and operated by Petrozim Line (Private) Limited — owned by National Oil Infrastructure of Zimbabwe (NOIC) and Lonmin, 50 percent each. Lonmin Plc assumed the Lonrho shareholding. In June this year, the South Africa-registered platinum group metals producer Lonmin announced it was disposing its 50 percent stake in Zimbabwe's Petrozim for $14,8 million. Lonmin — listed on both the London and Johannesburg stock exchanges — announced it was part of strategies to focus on core business. the National Oil Infrastructure Company of Zimbabwe (Private) Limited," the mining group said in a cautionary. Subsequent to the disposal, Sakunda, through Trafigura, had reportedly rented the pipeline that has the capacity to deliver six million litres of fuel per day from Feruka to bonded warehouses in Msasa, Harare. The pipeline delivers around 80 percent of the petrol and diesel requirements for the country.